Dude gets head ripped off by low clearance in 3.. 2..
KEEP MY WHAT IN THE RIDE AT ALL TIMES?!?!?!!!!!?!?!! I love how everyone around him is Asian! GODZZIILLAA!!!!!!! And I'm FREEEEEEEEE!!!!! FREEEEEEE FALLLLLLINGGGGG out of this ride! Alright! This is a stick up! Something tells me that this might be in Japan.. or china. Just a thought though..
Notice they're all Asian except HIM. And he's so stupid, he doesn't realize the Asian next to him is barfing on his brand new designer shoes. 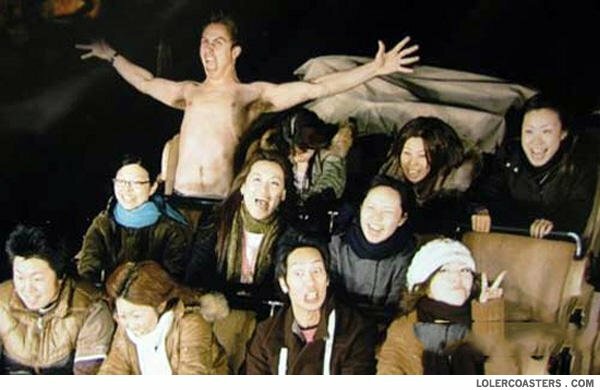 Somebody noticed that he is the only not Asian in the ride? Something tells me thats in Japan.. or China.. Just a thought though..